Stove-Sellers has a wide and varied customer base which include British, French & Dutch home-owners, corporate clients and even celebrities! 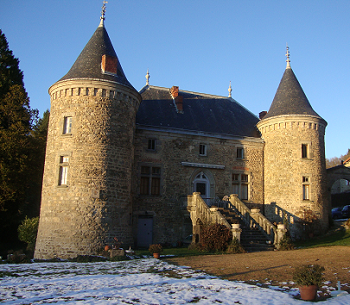 Our installations have been carried out in a diverse range of French properties from small country cottages & farmhouses, to public buildings and even some chateaux. We've received quite literally hundreds of testimonials from satisfied customers and an equal number of recommendations which has seen our business grow & prosper even during these difficult economic times so we must surely be doing it right!. This year, we would like to count you in amongst our increasing list of satisfied customers of whom, like those shown below, have had our products fitted in their properties previously. The client’s property had no chimney and asked if an insulated twin wall chimney system could be designed and fitted to suit his choice of wood-burning stove. Firstly, a full survey and thermal loss assessment of the customer's property established the most suitable size of stove required to heat the area inside the house sufficiently. Calculations were made and a suitably dimensioned flue system was ordered. The customer chose the popular Herald 14 stove made by Hunter Stoves and a fully conforming insulated stainless steel flue system was fitted. The customer was delighted with the result and the stove is used as the main source of heating for the property all year round. The owner of a 400 year old chateauu required a stove to be fitted into an existing large fire place and asked us to survey the original stone flue and report on its condition. 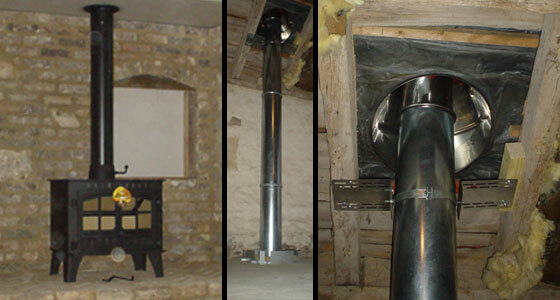 It was quickly established that the flue needed a thorough chimney sweep and for a flexible liner to be fitted. 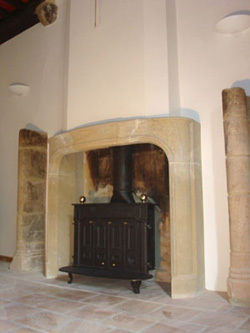 Once the liner was fitted and secured in place, an insulated register plate was fitted inside the gather of the fireplace which was then treated with a coat of heat resistant paint. The top of the chimney was fitted with a cover plate to prevent rain and bird ingress and a suitable (but invisible) rain cap was neatly cemented onto the top of the stack with a frost resistant mortar flaunching. 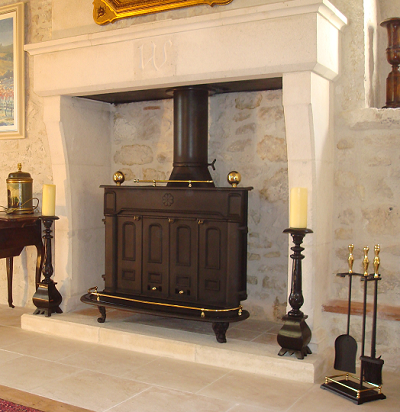 The customer’s choice of a Stovax Regency was the only choice of open fire stove suitable for his chateau! This customer was looking for a complete hot water and central heating solution for their recently purchased property in the Limousin. The customer wanted a large boiler stove and several radiators and wood burning cooking range heating a 200 litre water cylinder. Stovesellers supplied and fitted one of the biggest boiler stoves then available on the market (Hunter Herald 80B) which was connected to a fully controllable central heating system which comprised of several radiators and a towel rail in the bathroom. The boiler was large enough to accommodate the addition of further radiators a year later when the central heating system was extended into a barn extension and the project took over three weeks to complete. The customer also selected a solid fuel Rayburn 355SFW range cooker (see top of page) which was sited in the kitchen and then a domestic hot water was fitted which is heated by the hot water generated when the stove is use during the winter and supplied with an electric heating element which heats the cylinder during the summer months. Finally, this celebrity client near Cahors wanted a chateau style stove to suit his magnificently renovated medieval town house in the Lot. 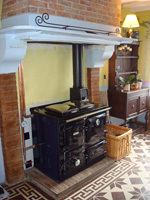 He chose a Stovax Regency stove with all the trimmings including brass fender and matching companion set. The seventies singing sensation who still tours today splits his time between his property in Ireland and France and his beautifully renovated fireplace even has his initial carved into the stone above. 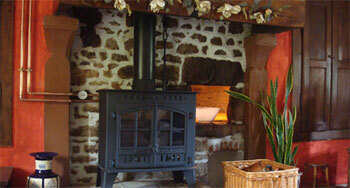 Can you guess who lives in a house like this and had their stove fitted by us?